Even Steam isn't immune to the lure of post-holiday surplus cash, launching a massive Holiday Sale during which every single game in the store is marked down 10 to 75%. They're overstocked on digitally downloadable titles, and everything must go! Yes, I know you can't technically overstock digital games, but everything still must go, and by everything they really mean everything. Left 4 Dead is 25% off. Portal and BioShock are both on sale for $4.99 a piece. 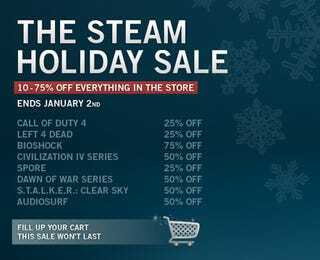 There's 25% off everything Ubisoft, 25-50% off THQ, and 25-75% off everything 2K. Needless to say, if you bought anything off of Steam in the past month, you're probably feeling pretty silly right about now. Don't let it happen again. The Steam Holiday Sale ends January 2nd.